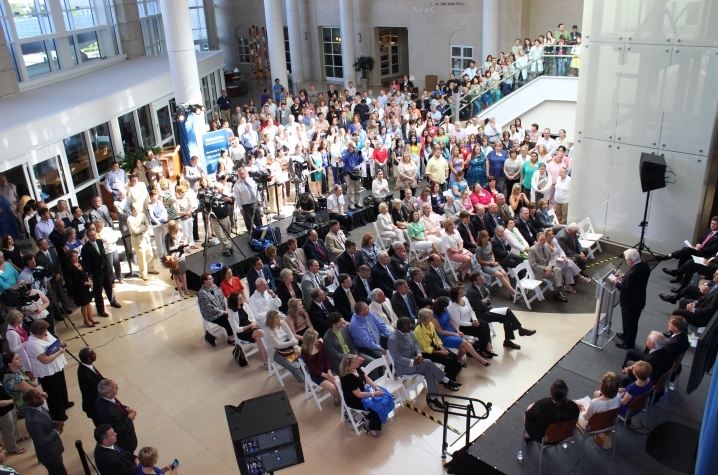 LEXINGTON, Ky. (July 12, 2013) – The University of Kentucky Markey Cancer Center was joined by national, state and local leaders today to celebrate its designation as a National Cancer Institute cancer center. The UK Markey Cancer Center is the 68th medical center in the country to receive this prestigious designation, and is the only NCI-designated cancer center in the state of Kentucky. "Kentucky’s extraordinarily high cancer rates cause untold suffering within our families," said Kentucky Gov. Steve Beshear. "They significantly increase health care costs, and they siphon away worker productivity and intellectual and cultural contributions. 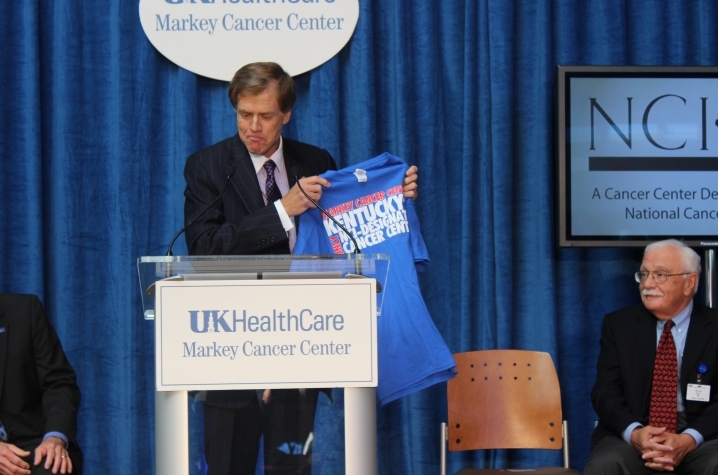 The Markey Cancer Center’s NCI designation is a bold statement that Kentucky does not have to accept the intolerably high cancer rates that have plagued our people for years. Today’s announcement is recognition that we have the capacity to do leading research and offer the absolute best care to our people." Additionally, the NCI designation allows Markey to communicate and collaborate on new advances in cancer care with other NCI-designated cancer centers across the country. Locally, Markey will be able to increase community engagement, including volunteers, patient advisory groups, and education and intervention programs. 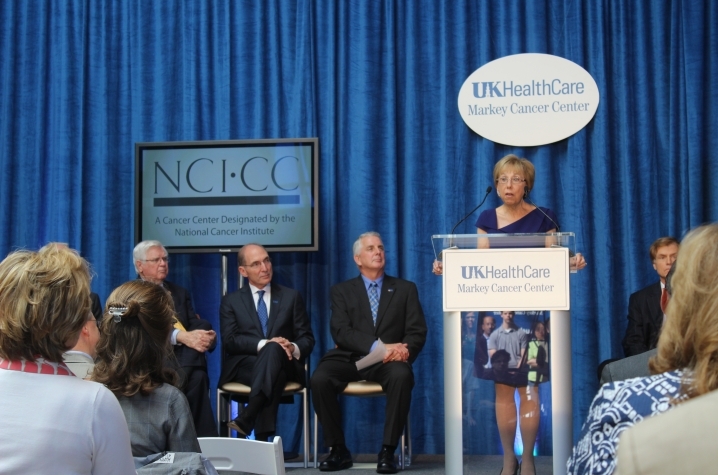 "I was honored to assist the University of Kentucky and the Markey Cancer Center in their efforts to obtain the National Cancer Institute designation, which will be a tremendous asset for those battling cancer across the Commonwealth," said Sen. Mitch McConnell. "This designation, along with the partnership with Norton Healthcare, means UK will be one of the preeminent cancer research and treatment centers in the United States. The university will be able to recruit the brightest researchers and clinical scientists to develop novel cancer treatments, and, most importantly, Kentuckians will not have to travel out of state to find the most advanced care and clinical trials." UK also joins an elite group of medical centers across the country who have earned the "trifecta" of national federal funding. UK is one of only 22 medical centers in the United States that have earned an NCI designation, have a federally funded Alzheimer's disease center (UK Sanders-Brown Center on Aging), and have earned the Clinical and Translational Science Awards grants. "This is a historic day for the University of Kentucky," said UK President Eli Capilouto. "This is why we are here; beginning today, with the National Cancer Institute’s Markey Cancer Center, we will no longer indulge the scourge of cancer in Kentucky." As the major referral center for Central and Eastern Kentucky, the designation also strengthens UK HealthCare's overall mission of ensuring no Kentuckian will have to leave state lines to get access to top-of-the-line health care. 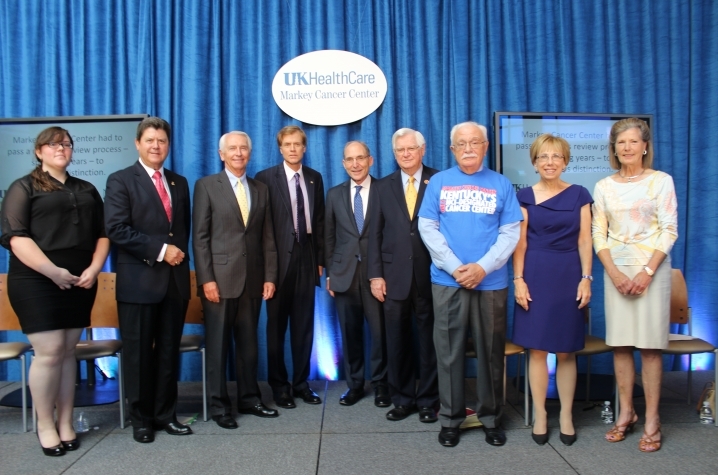 "Thousands of southern and eastern Kentuckians are in the fight for their lives, as they battle some of the highest rates of cancer in the nation," said U.S. Rep Hal Rogers. "And for decades, the University of Kentucky and the Markey Cancer Center have been with them every step of the way, dedicating each day to the life-saving quest for patients in the mountains and across the Commonwealth. This national designation will enhance research opportunities and bolster cancer treatment where it's needed most. I commend the leaders who envisioned more than a facility for treatment and committed their lives to research and education so we can celebrate sending more survivors home to their families in the near future." "At UK HealthCare, we serve not only Lexington and the Bluegrass region, but all of Kentucky and beyond," said Dr. Michael Karpf, UK executive vice president for health affairs. "Earning an NCI designation is a stamp of approval that means Markey is a first-class cancer center, comparable to the very best centers in the country — we can assure our patients that no matter how ill they are, or how complex their medical problems are, we can care for them right here in the state." NCI designation has been the goal for Markey since Cancer Center Director Dr. Mark Evers arrived in 2009. 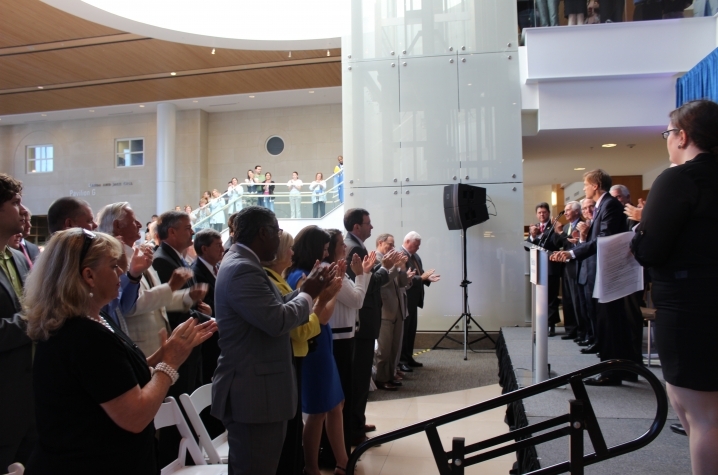 "We've taken extraordinary steps in recent years to help combat cancer incidence and mortality, through promoting preventative measures, improving current treatments and patient access and facilitating cutting-edge cancer research," Evers said. 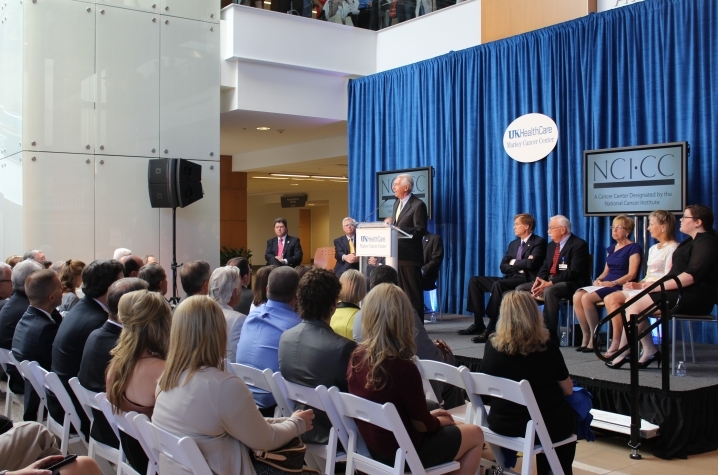 "Our NCI designation will shine a new light on this area in Kentucky and allow us to take even bigger steps to improve cancer care and research in this state through prevention programs and clinical trials." Markey's clinical and research work is backed by the university, the Commonwealth of Kentucky, and philanthropy through the Markey Cancer Foundation. 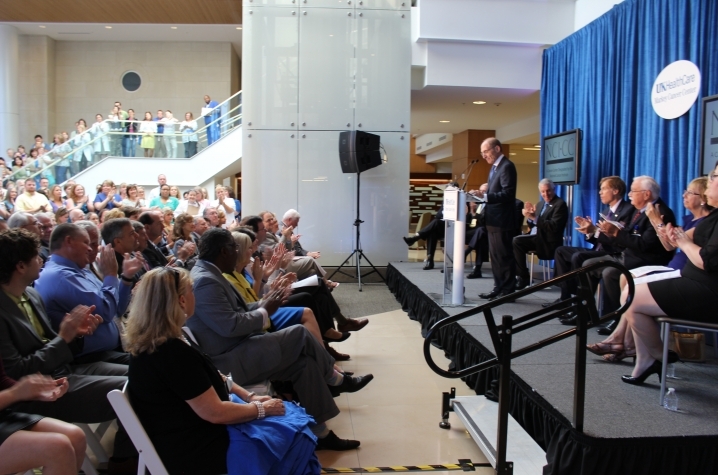 In fact, since 2009, nearly $114 million in institutional, state and philanthropic funds has supported the recruitment of cancer researchers and clinician scientists and the construction and renovation of clinical and state-of-the-art research space specifically for the oncology research and clinical programs at UK. 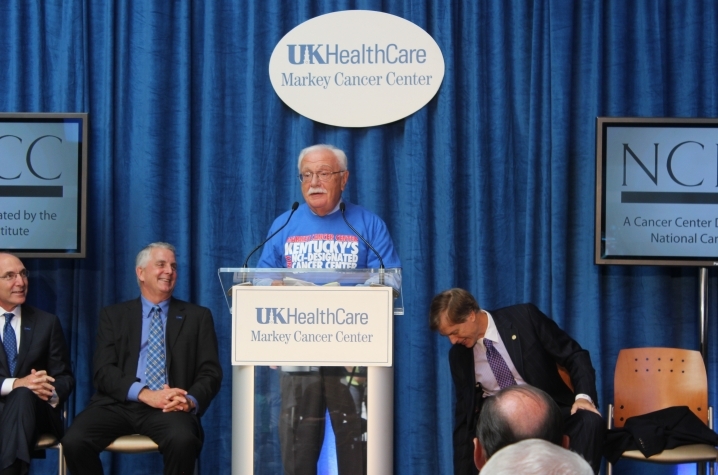 "It is an honor to support cancer research and patient care at the UK Markey Cancer Center," said Markey Cancer Foundation chairman Sally Humphrey. "At the Foundation, we want the community and region to know how important Markey is for the citizens of Kentucky and beyond. Earning the NCI designation highlights not only the work Markey has done so far, but also the great work the faculty and staff will do for Kentuckians in the future."